Judson (Jet) Lyons, Jr. was born on April 3, 1930, to the late Judson Lyons, Sr. and Pauline (O’Bryant) Lyons in Philadelphia, PA. He received his education in the Philadelphia Public School System. He accepted Christ as his Lord and Savior at an early age at Mt. Pleasant Baptist Church in Philadelphia, PA, under the pastorate of Rev. I. L. Robinson. Jet served in the Merchant Marines and The United States Air Force. Upon discharge, he came to Cleveland, OH, where his father had relocated. Here, he met the late Dolores Ann Mickler whom he was united in holy matrimony. She preceded him in death on January 2, 2000. To this union came Kirby, Cheryl, Judson III and Sara. In 1967, he led his family to unite with Second Tabernacle Missionary Baptist Church. 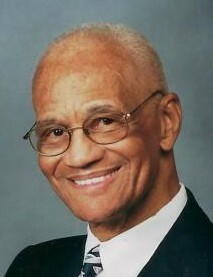 He served as Sunday School teacher, Trustee and Director of the Baptist Training Union. Jet was a long time member of Alcoholics Anonymous where he helped many to live a life of sobriety. He recently celebrated his 36th anniversary of sobriety. He married Lila G. Wilson on November 11, 1989. She departed this life on September 4, 2015. Jet worked for the City of Cleveland Water Department until his retirement in April 1996. Jet was a faithful Christian – a Man of God. In 1999, he united with Warrensville Road Community Baptist Church and was a faithful worker. He served as Leader of the Thursday morning Bible Study and Leader of the Senior’s Ministry. He served with the Men’s Fellowship Ministry. His commitment to his spiritual growth was evident in his regular attendance at Sunday school and bible study. He loved his church and was a faithful steward. Jet was a sought-after speaker serving multiple times as a keynote speaker for his church and community events. On Tuesday, August 28, 2018, Jet transitioned to Glory and now rests spiritually in the arms of the Lord. He is survived by a loving and devoted family. He leaves to cherish his memory and carry on his legacy two sons, Kirby (Valencia) Lyons and Judson Lyons III; two daughters, Cheryl (Michael) Thomas and Sara Fields; one stepson, George (Fran) Wilson; three brothers, Kenneth, Jeffrey and Dewayne Lyons; nine grandchildren, and a host of other loving relatives and so many treasured friends. He sowed seeds of great love into the lives of Ronnee Brooks, Stephen and Brandi Wilson and Dominique McIntyre. He was greatly loved by all who met him because he loved greatly. His humble, gentle and loving ways will be missed daily. Donations can be made in his memory to Warrensville Road Community Baptist Church (WCBC) 2020 Vision and mailed to 5045 Warrensville Center Road, Maple Heights, OH 44137. This would then cause the service info currently listed under obit would be moved to the 'service' tab.